Evaluation has come of age. Today most social and political observers would have difficulty imagining a society where evaluation is not a fixture of daily life, from individual programs to local authorities to parliamentary committees. While university researchers, grant makers and public servants may think there are too many types of evaluation, rankings and reviews, evaluation is nonetheless viewed positively by the public. It is perceived as a tool for improvement and evaluators are seen as dedicated to using their knowledge for the benefit of society. 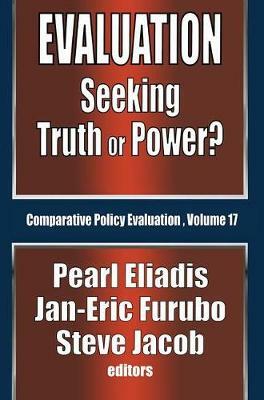 The book examines the degree to which evaluators seek power for their own interests. This perspective is based on a simple assumption: If you are in possession of an asset that can give you power, why not use it for your own interests? Can we really trust evaluation to be a force for the good? To what degree can we talk about self-interest in evaluation, and is this self-interest something that contradicts other interests such as "the benefit of society?" Such questions and others are addressed in this brilliant, innovative, international collection of pioneering contributions.